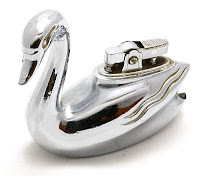 This table lighter in a distinguished form of a young swan was manufactured in the beginning of the 1960s by M.T.C. in Japan. M.T.C. was a quite successful Japanese company active in the 50's and 60's. There are a lot of interesting examples of the craftsmanship of M.T.C. Looking around the lighter market M.T.C. produced mainly chrome plate cigarette lighters. The Swan is made of heavy chrome plate and the lighter insert is not removable. The letters M.T.C. are inscribed in a bell on the bottom of the lighter base. The MaruMan T2 Electric Table Lighter was marketed in the 1970 in Japan. It is one of the most interesting examples of the evolution of piezoelectric technology fitted in MaruMan table lighters. The first Maruman piezoelectric table lighter was introduced in 1967 and simply called "Business Lighter". It was three years after (December 1964) Mansei Koyo Kabushiki Kaisa of the MaruMan company produced the first piezo lighter in the world. This unique table lighter is made of various materials: brass with gold plating, black and white plastic and of course the heavy hand-cut leadcrystal. The mechanism of the lighter is very simple though still sophisticated: when the white button is pressed the lighter lits and also a lamp build into the crystal turns red. When the button is released the lamp turns blue. When the button is pressed again both the light and lighter are switched off. Very similar lighters were manufactured also by another Japanese company called "Modern", for example its model "Gloria".